THE TRUSTED WAY TO RENT A SUIT OR TUXEDO FOR THE BIG DAY. This charcoal grey two button framed notch lapel tuxedo is a classic and timeless piece to wear to your next soirée. This tuxedo by world-renowned Michael Kors is fitting for an important celebration, wedding, or life event, no matter the time of year. 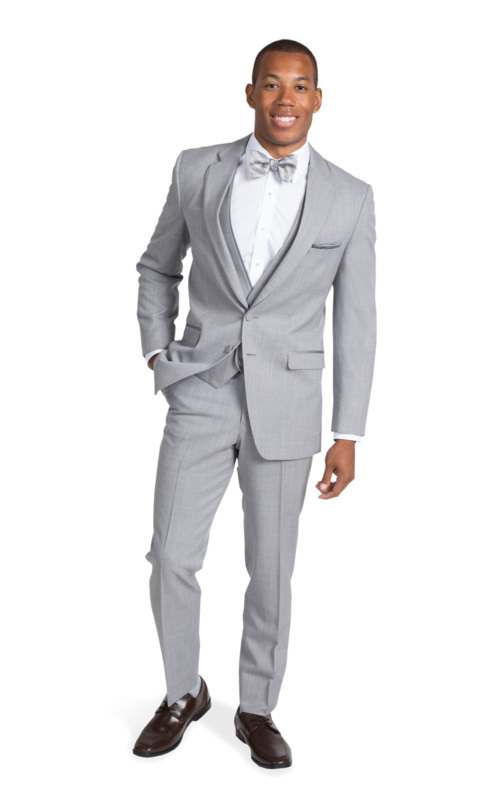 The Heather Grey Suit by Allure Men offers a lighter take on the traditional grey suit, without sacrificing the versatility of this popular color. This light grey two button notch lapel suit by Allure Men is a timeless staple for your wardrobe. Make a statement at your next formal occasion with the sophisticated and impeccably designed white Casablanca dinner jacket by Savvi. White one button dinner jacket with a shawl lapel. The Navy Lorenzo Tuxedo by Midnight Blue is chosen time and time again by men who appreciate a timeless tuxedo. This navy tuxedo features a black satin shawl lapel, adding a bold touch to any look. Easily order your perfect look online. Have a question? Our stylists are available online and in-store at 30+ Southern California and Nevada locations. Enter the code you recieved from a family member or friend to quickly enter your measurements an move on to checkout. Whether your group is big or small, Stitch & Tie will help you style and manage your group members. Great for weddings, parties and dances! A Glamping Wedding for 2 Grooms! And the Oscar Goes To....Velvet Tuxedos!